Many people I’ve talked to in the past year are not aware that while President Obama talks about the importance of nuclear disarmament, he and his administration are planning to replace and rebuild the nation’s entire industrial capacity for nuclear weapons production at 3 key sites, with the goal of producing up to 80 new warheads per year for another 50-100 years. This summer I joined protests at each of these 3 sites. 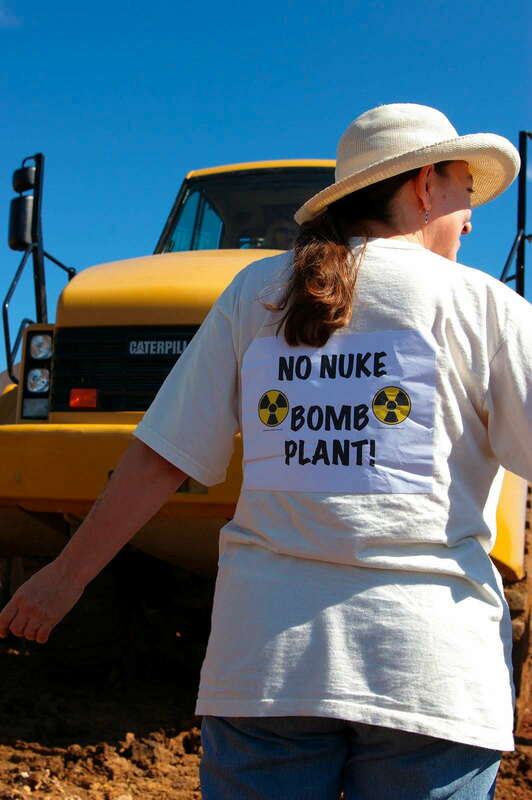 On July 4th and 5th I protested at the Y-12 nuclear weapons complex in Oak Ridge, Tennessee, where a new facility will be built for manufacturing highly enriched uranium secondaries. On the 65th anniversary of the U.S. bombing of Hiroshima, I joined a protest at the Los Alamos nuclear weapons lab in New Mexico, where a new plutonium pit factory will be built. The following week, on August 16, I was in Kansas City, where the remaining 85% of unique and critical components of nuclear warheads will be produced at the new plant. And I knew what my response had to be to the first nuclear bomb plant to be built in my adult lifetime – I had a responsibility to try to stop it. So I stood in front of the bulldozer on August 16 not with the intent to trespass, but rather to try to prevent a crime from being committed. I did it as an act of conscience to try to save our planet from the nuclear threat. I did it because I understand the importance of civil resistance to bring about nonviolent social change, thanks to the many powerful examples in our nation’s history, and because I understand my responsibility under international law to prevent war crimes and crimes against humanity. As a Jewish woman who has family members who survived the Holocaust, and some who perished, I have always very seriously regarded the responsibility of each individual to act to prevent war crimes. I have wondered what more ordinary citizens could have done to prevent the deaths of millions in the gas chambers. If a few courageous individuals, albeit at great risk to themselves, had dismantled a portion of the railroad tracks leading to Auschwitz or other concentration camps, for instance, they could have saved lives even as they were breaking the law by destroying property. Certainly there are times when it is necessary to break a law in order to prevent a greater crime. And here we are, decades after the killing of so many innocent people in the Holocaust, decades after the killing of so many innocent people in Hiroshima and Nagasaki, with enough nuclear weapons to destroy life as we know it – and still our country plans to spend billions of dollars to build more. Planning and preparing for nuclear war, and producing components for nuclear weapons at the Kansas City Plant in Kansas City, Missouri is a clear violation of international humanitarian law. So I pleaded not guilty to the charge of trespass because I did not break the law. I acted in a reasonable and nonviolent manner, as is my right and responsibility under international law, to prevent a crime from taking place, and to uphold the law. I did because I know that it is up to each of us, now, before it is too late, to stop a nuclear holocaust. Felice Cohen-Joppa is co-editor of the Nuclear Resister newsletter.